What is a GTIN and what is a GTIN-12? A barcode is a graphic symbol used to convey data. Typically the characters in a barcode symbols consist of bar/space patterns. The most common linear barcode is the UPC barcode (aka UPC-A). The barcode image above is an example. Please note that there are numerous other types of barcode languages. Just as English and French use the Roman character set (A, B, C, etc), the various barcode languages use bar/space patterns to convey data. 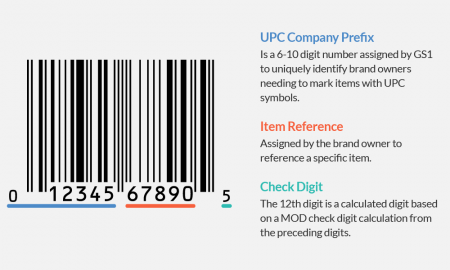 The UPC-A barcode symbol contains 12 numeric digits. The basis of the GTIN identification system works of unique company identifiers assigned to each company. GS1 global is a standards organization which overseas the numbering and guidelines for product identification. There are local GS1 offices in over 104 countries who primary role is to license GS1 Company Prefixes to companies within their country. In the US, GS1 US is the local office. The uniqueness of brand specific GS1 Company Prefix allows products to be accepted and recognized across the globe. Each country establishes their own pricing rules for licensing GS1 Prefixes, which are normally based on the total number of products a company needs to identify. The denominations are normally;1-10, 1-100,1-1000,1-10000,1-100,000, For exact pricing for US company, please click here. Each individual product that you are planning on selling will need its own unique UPC Code. 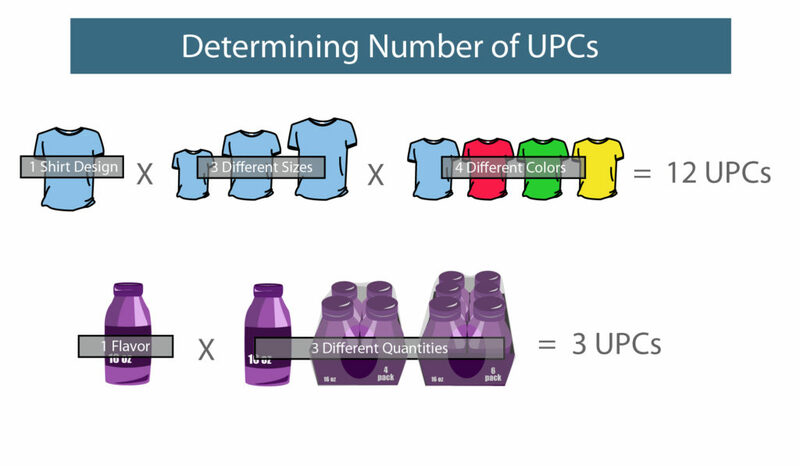 Each variant of product will require a unique UPC so products of different size and colors will each be unique represented with an individual UPC. What is the difference between UPC and EAN barcodes? As stated above, UPC are “Universal Product Codes” are acceptable around the globe. EAN stands for European Article Number and was the identifier commonly used internationally. Before 2005, manufacturers were challenged because the US used UPC and 13-digit EAN barcodes were used internationally. The EAN format is essentially identical to the UPC but contains a leading “0” to make the number of digits 13. Since the UPC was only 12-digits, it normally did not present problems to overseas POS systems. However, the 13-digit EANs could not be read by US stores. All of the EAN country organizations and the UCC (Uniform Code Council) came together to form GS1. One of the first initiatives was to establish the 2005 Sunrise Date which educated US companies on the necessity to enable their systems to read 14-digits (GTINs). Today’s scanners can now read EAN and UPC barcodes so there is never a reason to put both types on a product. US companies should ONLY use the UPC barcode. Where do companies go to purchase UPC Codes? Despite the tremendous amount of incorrect information advertised online for cheap UPC codes, companies do not purchase UPC Codes. They need to license a GS1 Company Prefix associated to their company. The size of the GS1 Company Prefix they license is dependent on the number of items they need to identify. Please visit this educational page to learn more about UPC and how some companies provide resold UPCs. https://www.barcode.graphics/education-upc-symbols/. Once a company properly licenses a GS1 Company Prefix and is given an allotment of GTINs they can use to identify, companies like Bar Code Graphics can provide the actual barcode symbol. For items which have yet to be printed, digital barcode files (.eps format) can be created. For companies who already have packaging, printed labels can be provided.